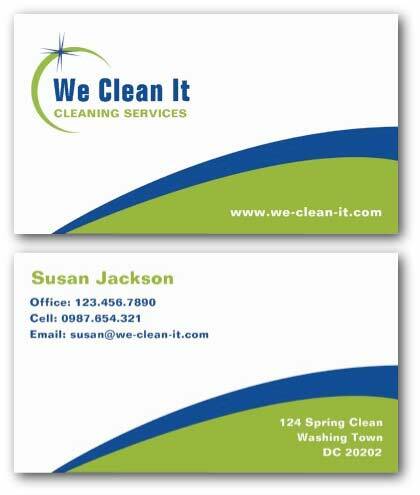 Ne14 Design has created the following business card templates suitable for a range of cleaning services businesses. You can customize each card online and place an order with our printing buddies at Zazzle - just follow the link at the bottom of the page. 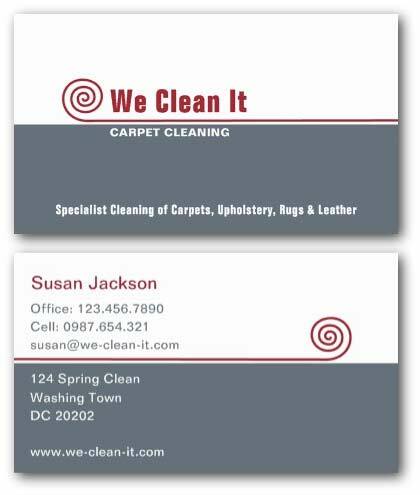 This cleaning services business card has a modern design with a sparkle logo that surrounds the beginning of your company name. A contemporary design in blue and green with all of the text fully customizable so you can add your own contact details. This card could be used for any cleaning business, such as; domestic, commercial, office, industrial, oven, floor, or even car valeting. 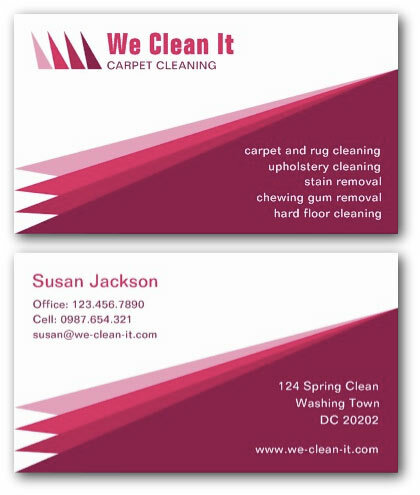 This business card can be used for a carpet cleaning, floor cleaning or even a carpet laying business. The design uses a red spiral logo representing a carpet or rug over a floor. The front of the card also has a line where you can place a short list of services that your company provides. 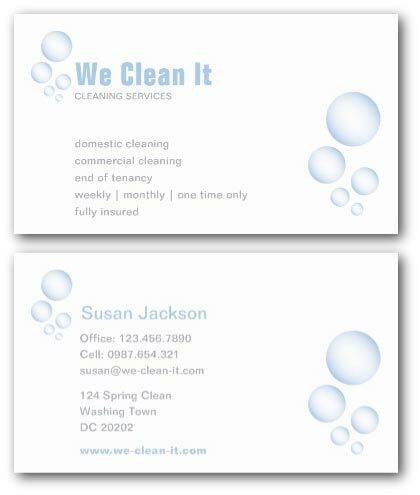 This simple cleaning business card uses a logo with some soap bubbles to represent washing. Again, this is another card that would be suitable for a variety of cleaning service businesses, such as; a laundry service, steam cleaning, pressure washing, oven, window cleaning, car valet, upholstery or maid service. This stylish business card template is suitable for carpet cleaners, floor cleaning or driveway cleaning. The front of the card has space for a list of five services. 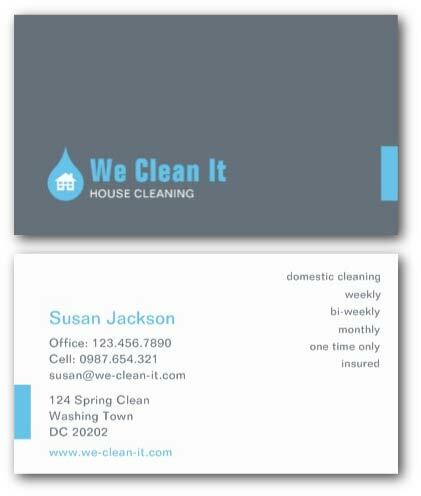 This contemporary house cleaning business card uses a simple logo of a house inside a water droplet. Suitable for professional home cleaning, domestic, residential, property and maid cleaning services. 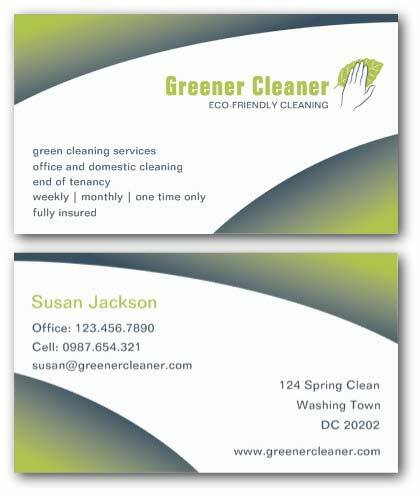 This green cleaning business card is for businesses using eco-friendly natural cleaning products who want to market themselves as environmentally friendly. An illustrative logo of a hand using a leaf to wipe a surface clean is used to represent eco-friendly services. 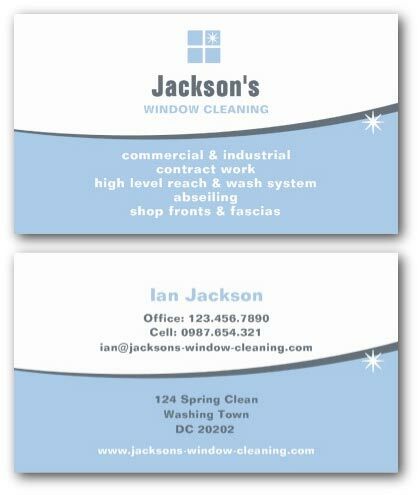 This business card template is suitable for a window cleaner's business with a simple logo of a window with a squeaky clean shine represented by the sparkle.